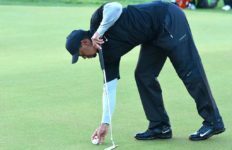 Tiger Woods is again in a battle to make the cut Friday at the $7.2 million Genesis Open at the Riviera Country Club in Pacific Palisades. Woods fired a 1-over-par 72 in Thursday’s first round, putting him in a 25-way tie for 63rd when play was suspended due to darkness at 5:48 p.m., with 12 players left to complete the round. The field will be reduced to the low 70 plus ties at the conclusion of the second round Friday. Woods is playing for the first time since tying for 23rd in last month’s Farmers Insurance Open in La Jolla, his first PGA Tour event in a year after being sidelined following a fourth back surgery. Woods needed a birdie on his final hole in his second round of the Farmers Insurance Open to make the cut. Woods began his round with a birdie on the par-4 10th hole, then put his tee shot on the 11th hole into a eucalyptus tree. “Eucalyptus don’t normally keep golf balls, but this one did,” Woods said. Woods bogeyed his next hole and birdied the one after that. He bogeyed the 15th and birdied the 17th. Woods began the front nine with a birdie, had three consecutive pars, bogies on the fifth and seventh holes and a birdie on the eighth. Defending champion Dustin Johnson, who is first on the Official World Golf Ranking, also struggled with a 3-over-par 74, putting him in an 11-way tie for 107th, eight strokes off the lead. Patrick Cantlay and Tony Finau share the lead at five-under-par 66, while Tom Hoge, Dominic Bozzelli and Sam Saunders are one stroke back. All five players are Americans. Cantlay, who played two years at UCLA before turning professional in 2012, had six birdies and a bogey on the fourth hole. If he retains the first- round lead at the completion of the round, it would be the first time he’s held the lead or co-lead after 18 holes on the PGA Tour. This is his 47th start on the PGA Tour. “I thought tee to green I hit the ball very solid,” said Cantlay, who finished 29th on the FedExCup standings last season as a rookie after being limited to six tournaments over the previous three seasons because of lingering back issues. Cantlay got his first victory on the PGA Tour in November in the Shriners Hospitals for Children Open. Finau birdied four of his first five holes, and added a fifth birdie on the first hole, his 10th of the round. A bogey on the fourth hole was offset by a bird on the ninth. Saunders shot a 7-under-par 64 to take the first-round lead in last year’s Genesis Open, then followed with rounds of 77-73-68 to finish tied for 49th at 2-under-par. He is a grandson of the late golfing legend Arnold Palmer, who won the tournament in 1963, 1966 and 1967, when it was played on the Rancho Park Golf Course and known as the Los Angeles Open. 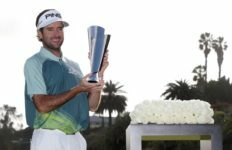 “I just feel like I’m a way better player this year,” said Saunders, who tied for eight in last month’s CareerBuilder Challenge, his best finish in his previous seven starts this season. `I’m more in control of what I’m doing.